Ezra Miller is making a name for himself in Hollywood and he is definitely coming for fashion. He was naturally on hand for the premiere of 'Fantastic Beasts: The Crimes of Grindelwald' at Cineworld Leicester Square yesterday evening(November 13th) in London. 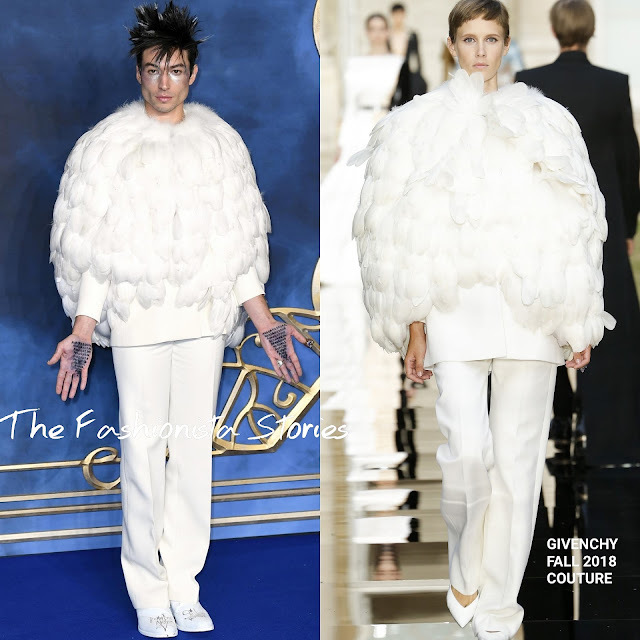 He broke the internet with his previous look and he is likely to get people talking again with this GIVENCHY FALL 2018 COUTURE look. He stepped out in a white feather & fur layered blazer and white trousers. His ensemble which was worn by a woman, is giving me bird vibes but if anyone can take this from the runway to the carpet, it's Ezra. However the pants needed to be hemmed. With the Harry Potter deadly spell written on his hand, he finished up with a edgy hair cut & makeup and white boots. Are you feeling Ezra's feather look?